The Japanese blue chip is leading a makeover of the way that country’s companies are governed. When Japan’s Sony announced in late January that it intended to separate its supervisory and executive functions, it became the first large Japanese corporation to respond to the wave of corporate governance reforms sweeping outward from the United States. It wasn’t the last, though. Just days after Sony made its announcement, it was joined by fellow Japanese electronics companies Hitachi (with its 18 listed affiliates) and Toshiba, which also said it plans to adopt a US-modeled board committee structure. 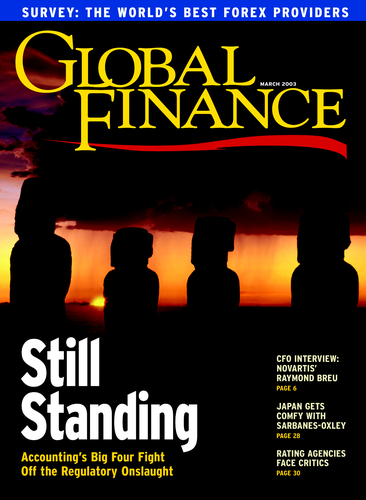 “These changes arise through influence, the feeling that the world standard for corporate governance is moving in a certain direction,” says Kenneth Siegel, a managing partner in the Tokyo office of law firm Morrison & Foerster. A revision in Japan’s commercial code that takes effect in April allows companies to separate supervisory and executive roles but, crucially, does not compel them to do so. Japanese regulators had intended to require all companies over a certain size to appoint outside directors but dropped plans in the face of strong resistance from companies. The boards at those companies have typically been closed shops, say observers. True outside directors are rare, says Marc Goldstein, director of Japanese research services for Institutional Shareholder Services (ISS), a Rockville, Maryland-based provider of proxy voting and corporate governing services. “Most of the outsiders that are present are affiliated outsiders, not independent outsiders,” says Goldstein, who also is a member of a recently formed advisory panel to the Tokyo Stock Exchange. Sony aims to set up three committees—compensation, nominations and audit—each reporting to the board, which exercises the oversight function. The company will be run on a day-to-day basis by another board of corporate executive directors (Sony set this up in 1997). The board of statutory auditors will be scrapped. Sony CEO and chairman Nobuyuki Idei says the company hopes to have a board of directors of between 10 and 20 members. Currently it has 11. It will also increase the number of outside directors, which now stands at three. The changes will not affect Idei himself; after he retires fully the posts of chairman and CEO will be split. This change is in line with recent SEC recommendations in the US. At present, the CEO also serves as chairman in around 80% of S&P; 500 firms, a situation the SEC says should change. There are compelling reasons why Sony might want to align its corporate governance culture with emerging practice in the US. The consumer goods giant had shipped 42% more of its of PlayStation2 consoles to the US by the end of 2002 over the year before, making it by far the fastest-growing market for its 50-million-unit seller. More pertinent still, an NYSE listing has helped push the percentage of its shares held overseas to between 35% and 40% of the company. Moves such as Sony’s certainly require a change in culture. Japanese companies have traditionally lacked transparency and accountability, says Michael Goldstein, finance professor at Babson College in Massachusetts and a former banker with Merrill Lynch in Tokyo (and no relation to ISS’s Goldstein). Time was in Japan when the three-pronged understanding of stakeholding—comprising shareholders, employees and banks—allowed a degree of complacency toward outside shareholders. A stricken banking sector has put paid to that, and Japanese companies have increasingly had to embrace a US- and Europe-oriented approach to shareholder value, even if, like Toshiba, they do not have a foreign listing. “As domestic ‘stable shareholders’ such as banks and fellow keiretsu group members sell off their shareholdings, Japanese issuers are forced to seek replacement shareholders, and foreigners are often the likeliest candidates,” says ISS’s Marc Goldstein. Investors may applaud the move to board committee systems, but external observers say more needs to be done. ISS’s Goldstein points out that while Hitachi and its satellites are introducing “outside” directors for the first time, some of these also serve as executives in the Hitachi group. That the commercial code can continue to view executives of a company’s creditors and major shareholders as outside directors also takes some bite from the regulatory framework. As revolutions go, it’s more velvet than convulsive. Immediately before announcements from Sony, Toshiba and Hitachi that they intend to shake up their governance structures, Tokyo newspaper Nihon Keizai Shimbun canvassed large Japanese firms on their stance on management reform. Nearly 60% of the respondents said they had no plans to adopt American-modeled governance systems, while around 40% said they were undecided on whether to switch from their current structure. The 34 Japanese companies that have New York listing will be under greater pressure to reform than non-US-listed firms, though the latter still vie for American and European capital. It’s unclear what exemptions to the Sarbanes-Oxley Act the SEC may allow to foreign firms. Still, “Japanese companies with shares listed in the United States are very concerned that US rules will apply to them, even where they don’t fit with typical forms of Japanese governance,” says Morrison & Foerster’s Kenneth Siegel.